"In this colorful novel, your whole family will learn what life was like during the Ice Age after the Flood. Packed full of scientific facts that can be used to defend creation and the Flood, and oppose evolution. Read through this book as a devotional with your children! (Supplemental study guide also available.)" "Fun way for the whole family to learn how the Bible explains the Ice Age—a colorful novel!" "A companion study guide to Life in the Great Ice Age. Perfect for high school and small groups!" I know personally a Christian family belonging to a strict Bible belt Baptist church. Because the public schools teach godless evolution and present all sorts of other subjects and values that do not conform with Biblical teaching and Christian life-style, they decided to let their children attend a special home-school set up by concerned parents. The "education" in this well-meaning school was for the children like growing in a barrel. The classes were small and both students and teachers came from guaranteed Christian background. There were daily Bible teachings, devotionals and also some secular subjects were taught such as Math or English. 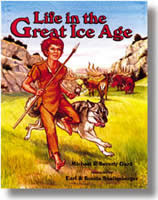 I could well imagine that the Baptist minister leading that local church and initiating and encouraging this safe Christian education for the children would love to have used the teaching materials provided by Beverly and Michael about what the Bible teaches about the Ice Age. The results of this safe Christian education and strict pastor-guided family life was total catastrophe. Because the faith of the teachers was more important than their professionalism the kids could hardly read and write proper English after finishing their years of education. They rebelled - of course they rebelled - and hit the worst things this bad world can offer to teenagers. They do not want to hear a word about Jesus and are living both physically and mentally as far from their parents as they can. It is a wolf in sheep's clothing. When such nonsense is offered to the children in the context of devotionals and Bible reading the parents and teachers will have a very lovely bright eyed group of children listening every word, trusting every lie, relying on the authority as God has built them. Once they grow up they shake off both the lies that Bevelry and Michael Oard are teaching and the Bible associated with it. Some stay in but those who find the truth will be free. It is not an easy road, to be free from such an overwhelming heritage. "Whosoever therefore shall humble himself as this little child, the same is greatest in the Kingdom of Heaven. And whoso shall receive one such little child in My name, receiveth Me. But whoso shall cause one of these little ones who believe in Me to fall, it were better for him that a millstone were hung about his neck, and that he were drowned in the depth of the sea."